Its safe to say Catherine stuck to a fairly basic "uniform" during the Olympics, often pairing navy jeggings with a navy blazer, with only one or two variations of this outfit. The one constant the Duchess sported were the Stuart Weitzman "Corkswoon" style cork wedges, seen here at a jumping equestrian event. This wedge shoe boasts a significant 4 1/2" high heel -- with added platform! 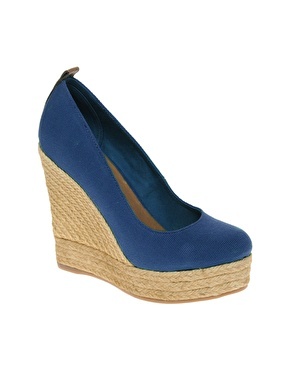 It is a closed pump style in a dark blue fabric upper and cork finished wedge with a button tab detail at the back. Kate's version, the "antique denim" upper, appears to be an on-line exclusive; other available variations of the style come in patent leather. 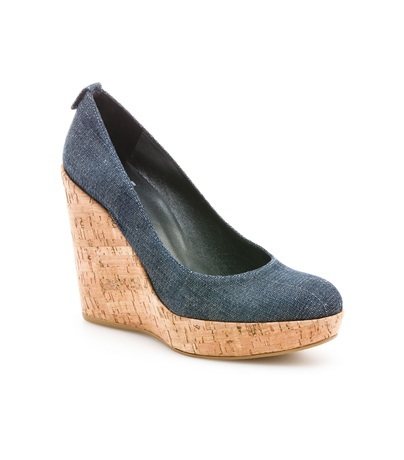 Retails for: ≈ $375 U.S.
Stuart Weitzman "Corkswoon" in navy antique denim. I thought finding a look-a-like of Kate's shoe would be easy but it actually was not! Who would have thought a fairly standard platform wedge pump would be rather difficult to find. One of the closest repli-Kates I found is actually a bit removed from the style in that it is an espadrille wedge, not a cork finished version. It is the shoe brand Aldo, via ASOS. But I chose it because it best matches the details of the original, including the insane heel height, denim style blue fabric upper, and tab detail at the back. Retails for: ≈ $99.42 U.S., as low as $51.09. Aldo (via ASOS) - "Drewel" canvas espadrille in navy. I included this ASOS Collection version (in cornflower blue) because it is true to the cork finish of the original, but just in case that height is too much for someone who loves the look and style of the original. Retails for: $42.58 U.S., as low as $20.44. 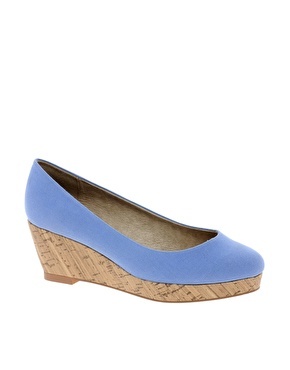 ASOS Collection - "Skye" wedge in cornflower blue. I almost don't want to include this next Gap shoe because it is so far removed from the original inspiration and actually looks a bit cheap in the picture. At 4" it is a slightly shorter height, with black leather and a wood style wedge. True to Kate's form it is a closed toe pump style. 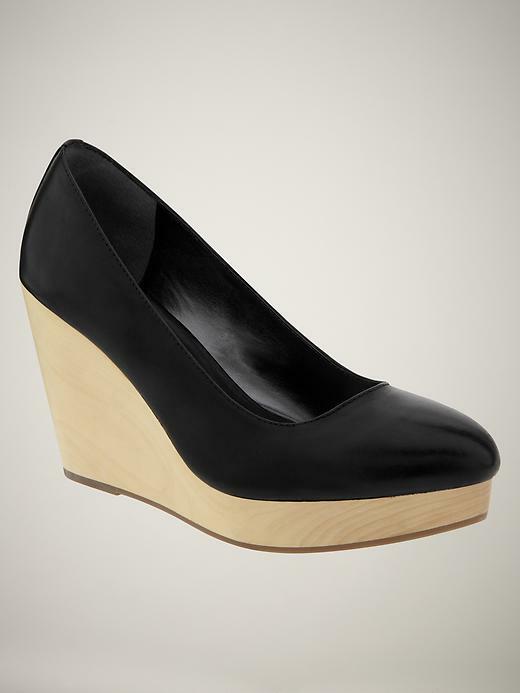 Retails for: ≈ $79.95 U.S.
Gap - wedge pump in true black. 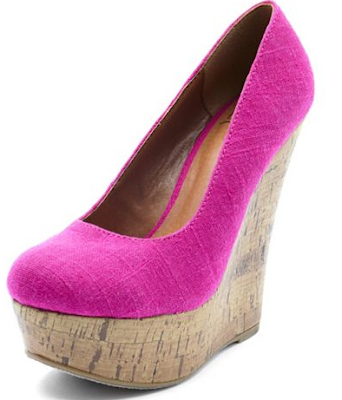 Finally the last and probably my favorite of the repli-Kates is this cork wedge from Charlotte Russe. The heel is over 5" and in a closed toe pump style in linen-like pink. It even has a similar rounded almond toe shape of the original. I even find that the fabric texture mimics that of the original's denim. I think I like it even more than the original because it is pink! That makes it a bit funner and makes for a great pop of color, though it might be a bit less versatile. Retails for: ≈ $34.00 U.S., as low as $12.50. Charlotte Russe - linen round toe cork wedge. I have also been frustrated trying to find this shoe.